Screenshot from the TV broadcast. 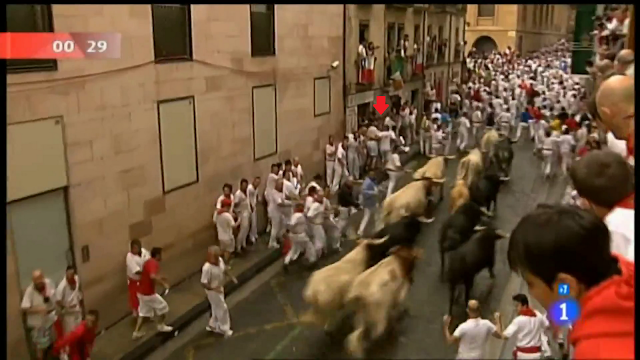 You can see Griff and I under the red arrow. This is a blog about music. You might think that before facing six one-ton bulls and six equally gigantic castrated steers, I would have had a nice little playlist prepared for my ipod shuffle, an electic mix ready to both pump me and and cool frayed nerves. Yet in those few minutes before facing a situation which every Spanish person I talked to said I was crazy to do (to Griffdawg as well), the farthest thing from my head was listening to one of the many jamandahalfs featured in these pages. In many ways I didn't need to. There was a beautiful cacophonous symphony all around la Calle de Santo Domingo in Pamplona that Saturday morning. Whispered prayers in a multitude of languages were joined by strangers wishing each other "suerte." People in balconies above were shouting words of encouragement to the half-crazy mozos below. TV crews snaked their way through the crowd, asking the inevitable question of why we were about to do what we were about to do, something we were all asking ourselves at that very moment. All these sounds were soon joined by a group of Brits who asked Griffdawg and I which way the bulls were going to come from, a surreal encounter not even two minutes before the bulls started their frantic run. The sounds I'll remember most are those of the group prayers in Castellano and Euskara to the beheaded Saint Fermin, the excuse for the week-long party and the reason we were wearing red pañuelos around our necks (to empathize). There was something undeniably calming about seeing the mozos chanting to the idol seated just above the street while waving rolled-up newspapers in unison. It gave a sense of unity. The proverbial quiet before the storm briefly descended upon us right before the first rocket signaled that the bulls had been let loose. That quiet I'm sure was accompanied by screaming thoughts which were soon joined by the beating hooves of the tons of animal quickly narrowing the gap between us. After running for a few seconds (which felt like a few hours), the streets of Pamplona were filled with very different sounds-the sounds of celebration. The city is infected by a remarkable energy during the festival, an energy which was very very loud. The rest of the day was full of bands passing through the streets, impromptu parades (my favorite was the one where everyone sang the "Spongbob Squarepants" theme song), laughter, and many bottles a-crashing. It was a feast for the ears and the soul. And being a Spanish fiesta, it was a blast.